This harness adapter will allow you to use an older OBD1 1992 to 1995 ECU ( 1992 to 1995 computer) in your newer 1996+ Honda or Acura vehicle. OBD2A to OBD1 harness, this harness adapter is designed for use with manual transmission only. Car replace ECU jumper, it is not designed for use with an automatic transmission. 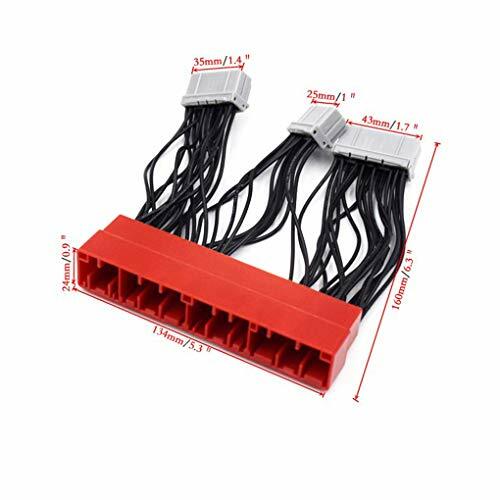 Use this jumper harness on select for Honda/ Acura vehicals easily connect OBD2A system to OBDI ECU. Made of high quality material copper core, durable and tough for a long time. Size: 160 * 134 * 24mm. 1 * car conversion ECU harness. If you have any questions about this product by Bobury, contact us by completing and submitting the form below. If you are looking for a specif part number, please include it with your message.